The American Industrial Hygiene Association (AIHA) commonly sets Workplace Environmental Exposure Levels Guides (WEELs) for chemicals lacking both Permissible Exposure Limits (PELs) set by the Occupational Safety and Health Association (OSHA), or Threshold Limit Values (TLVs) recommended by the American Conference of Governmental Industrial Hygienists (ACGIH). There has been an ongoing debate about d-limonene (citrus solvent) and its common use as a substitute for mineral spirits and other solvents. The AIHA has set an 8-hour time weighted average WEEL of 30 parts per million (ppm) for d-limonene, basically with regards to its irritative properties. This WEEL is more protective than the ACGIH TLV of 100 ppm set for mineral spirits. "D-limonene is not acutely toxic. In its pure form it is not a sensitizer, but it is irritating to the skin. Although the National Toxicology Program (NTP) has concluded that there is clear evidence of carcinogenicity in male rats, the effect has been attributed to a2u-G [a2u-G is a urinary protein] renal toxicity, which is both species and gender specific. Humans do not synthesize a2u-G, and metabolism studies indicate that 75% TO 95% of d-Limonene is excreted in 2-3 days with different metabolites identified in humans and rats. The Environmental Protection Agency (EPA) has concluded that the effect or its related kidney toxicity cannot be used to extrapolate human risk. In the 2-year NTP study, liver effects were noted in male mice at 500 mg/kg, and reduced survival was noted in female rats at 600 mg/kg. The no observable effect levels (NOELs) were 250 and 300 mg/kg, respectively. A WEEL of 30 ppm (165.6 mg/m3) as an 8-hour time-weighted average (TWA) is recommended to protect against these effects." The AIHA WEEL is interesting because it reflects concern with the irritative properties of d-limonene that CSA has referred to for years, at the same time, citrus solvents based upon d-limonene have been touted and marketed as "not-toxic" In reviewing the AIHA documentation of the WEEL, it was interesting to note that several cases of allergic responses were noted in individuals with existing allergies to turpentine and oil of turpentine. Artists should provide dilution exhaust ventilation, and avoid skin contact when using d-limonene, and products based on d-limonene. Odorless paint thinner and odorless mineral spirits are recommended. Art Hazards News Vol. 18 No. 1 printed an article on the Workplace Environmental Exposure Limit Level (WEEL) for d-limonene. The American Industrial Hygiene Association assigned a WEEL of 30 ppm, based upon potential liver toxicity in mice. It is not clear, however, how this relates to humans. D-Limonene also is a moderate skin irritant. The WEEL did not reflect the sensitization potential for oxidized d-limonene, which is well documented, because they based the WEEL on "pure" d-limonene. However, oxidation occurs when d-limonene is exposed to air. People already sensitized to turpentine and other turpenes may also be allergic to d-limonene. 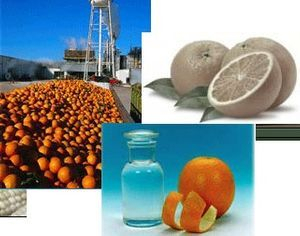 In addition, orange peel extracts contain many other turpenes besides d-limonene and are even more of an irritant. These articles were originally printed for Art Hazard News, © copyright Center for Safety in the Arts 1995. They appear on nontoxicprint courtesy of the Health in the Arts Program, University of Illinois at Chicago, who have curated a collection of these articles from their archive which are still relevant to artists today.